When we set out to build Power BI, we knew an important part of the vision to offer a world class business analytics experience would be the ecosystem of partners around us. Since the general availability of Power BI on July 24th, we’ve been shipping a new partner integration in Power BI every week and we are getting great feedback from our customers on how the collaborations are inspiring them to experience their data in new ways. This week, I am pleased to announce a new collaboration with Alteryx, Inc. that will enable Power BI as an output destination. 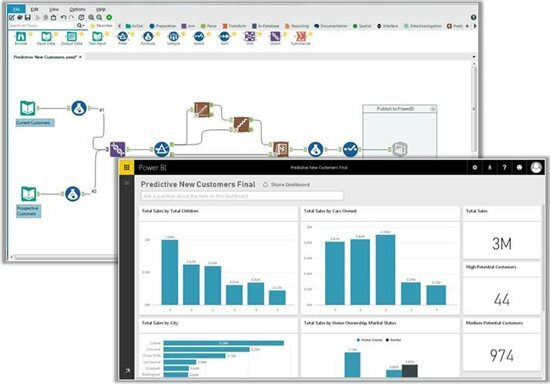 This direct integration will enable Alteryx users to view the results of their data blending and advanced analytics directly in Power BI, ultimately resulting in beautiful operational dashboards and reports. The simple drag and drop workflow within Alteryx enables data blending and then the application of predictive and spatial analytics for business analysts to create deep analytics that drive actionable, forward looking insights. Another point of integration with Power BI and our partner ecosystem is our support for content packs, which have been rolling out every single week. Content packs offer a quick and easy way for business users to gain out-of-the-box insights over the most popular line of business SaaS applications. When Power BI users connect to their data via a content pack, they get a curated collection of dashboards and reports that continuously update with the latest data from their account. We have shipped over 28 content packs to date; additionally, there are 30+ content packs under development in collaboration with our ISV partners. Some of the newest members of this ever growing list of partners includes Adobe Analytics, Webtrends, comScore, Stripe and tyGraph. Alteryx also provides a Visualization Kit for Microsoft with analytics examples to help customers get started. The new kit can be downloaded at www.alteryx.com/msftkit. Continuing to embrace new integrations, sources and experiences is just one way we’re delivering on our commitment to deliver value to our users with unmatched speed and agility. With the rapid release cadence for the Power BI service and Power BI Desktop, you can rest assured that there are many more partner stories like these on the way. It’s been fantastic working with the Alteryx team to bring this solution to market. Find out more about it at our upcoming webinar on November 3.